He had no political party, no royal office, and no government commission. He possessed no personal fortune, nor was he backed by any state or corporate interest. Yet he met personally with dozens of heads of state: prime ministers, presidents, kings, emperors, princes and princesses—as well as legislators, ambassadors, cabinet ministers, first ladies, governors, mayors, generals, chief executives, judges and other leaders of government and industry. Flying across the globe in his plane like a shuttle diplomat, this private citizen met with British Prime Minister Margaret Thatcher; King Leopold of Belgium; American First Lady Nancy Reagan; Chinese Premier Deng Xiaoping; Ethiopian Emperor Haile Selassie; Jordan’s King Hussein; Egyptian presidents Anwar Sadat and Hosni Mubarak; and the emperor, crown prince and seven successive prime ministers of Japan. In between, he met the presidents, prime ministers, and/or kings of Spain, the Philippines, India, Indonesia, Thailand, Nepal, Sri Lanka, Lebanon, Bangladesh, South Africa, Kenya and Chile— and ambassadors from dozens more countries. Oftentimes at banquets and meetings between such luminaries and himself, it was the latter who was the keynote speaker or the guest of honor. Most of these leaders knew his work and his message, many met with him as an equal, and some even poured out their hearts to him. Mr. Armstrong meets with First Lady Nancy Reagan in the White House in 1985. Officials drew comparisons between this indefatigable elderly man and U.S. Secretary of State Henry Kissinger, another legendary world traveler with whom he shared the skies. 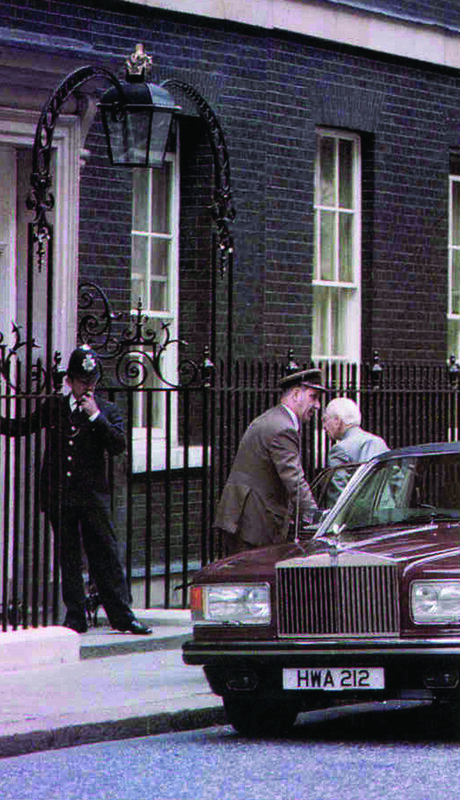 : Mr. Armstrong arrives at 10 Downing Street for a private half-hour meeting with Prime Minister Margaret Thatcher about problems in the Middle East. 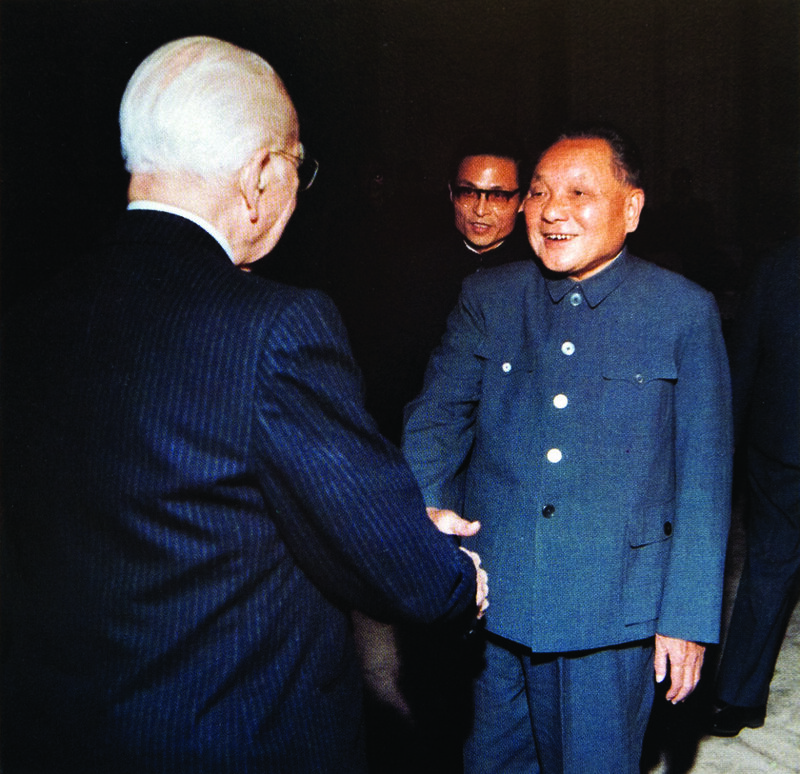 Deng Xiaoping, leader of China, greets Mr. Armstrong in Beijing. 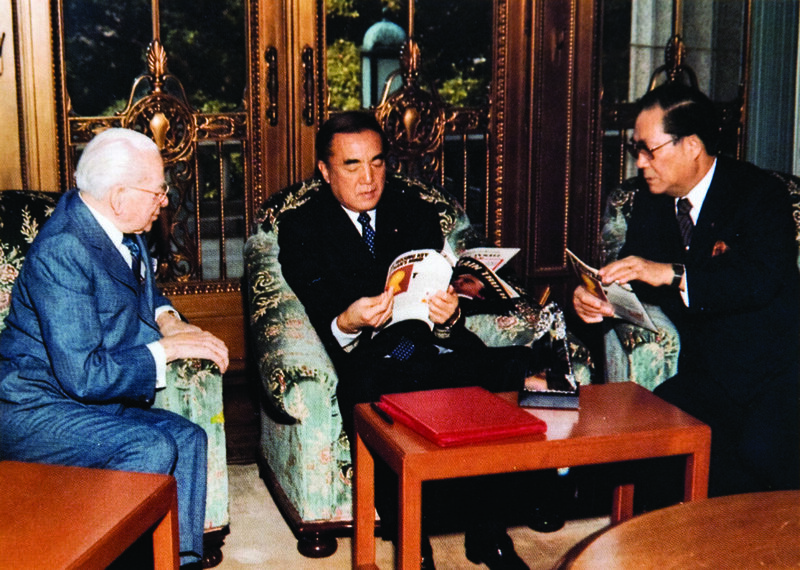 Shortly after his election as prime minister, Yasuhiro Nakasone (right), received Herbert Armstrong at his office in Tokyo. They discussed trade and labor difficulties facing the United States and Asian nations. Meanwhile, though he also rubbed shoulders with Nobel Prize winners, artists, singers and athletes, he spent much of his time among the middle class, the lower class, and the tragically impoverished. He teamed up with other leaders in science and education to improve the lives of thousands and millions. World leaders called him an ambassador without portfolio with a commission for peace. His name was Herbert W. Armstrong. A prolific author, educator, philanthropist and minister, Herbert W. Armstrong taught the true causes of the problems facing humanity and their ultimate solutions. He published the Plain Truth magazine, read by 1 out of every 583 people on Earth; broadcast the World Tomorrow program, seen on 382 television stations and 36 radio stations; and founded three campuses of the well-regarded Ambassador College. Leaders across the globe respected his message, extended him personal invitations, and collaborated with him. Several became his close friends. Mr. Armstrong sometimes traveled 300 days out of the year. But his greatest passion was not for Jakarta, Pretoria, Manila, Cairo or even London or Washington. His greatest passion was for Jerusalem. As a devoted student and teacher of the Bible, Mr. Armstrong believed in the glorious future of Jerusalem. He flew to the new nation of Israel more frequently than anywhere else; during one four-year period, he returned about 50 times. The first official to welcome Mr. Armstrong into “a partnership with Israel” was a signer of the 1948 Declaration of Independence, Tourism Minister Moshe Kol. From that initial partnership at the Knesset in 1968 to his death in 1986, Mr. Armstrong met with President Zalman Shazar, Prime Minister Golda Meir, President Ephraim Katzir, Prime Minister Yitzak Rabin, Prime Minister Menachem Begin, President Yitzhak Navon, President Chaim Herzog and Prime Minister Shimon Peres. In his two decades of involvement in Israel, Mr. Armstrong also formed a strong bond with the mayor of Jerusalem, Teddy Kollek. “The greatest builder of Jerusalem since Herod” went on to be reelected five times, and he counted Mr. Armstrong as a close friend through almost his entire public career. The two often worked together and could be seen walking arm in arm through the streets of Jerusalem. Mr. Armstrong’s closest partnership was with Prof. Benjamin Mazar, the former president of Hebrew University and Israel’s preeminent archaeologist. Together, Hebrew University and Ambassador College excavated the southern wall of the Temple Mount, providing an invaluable contribution to the heritage and history of Jerusalem. The project lasted for more than a decade. 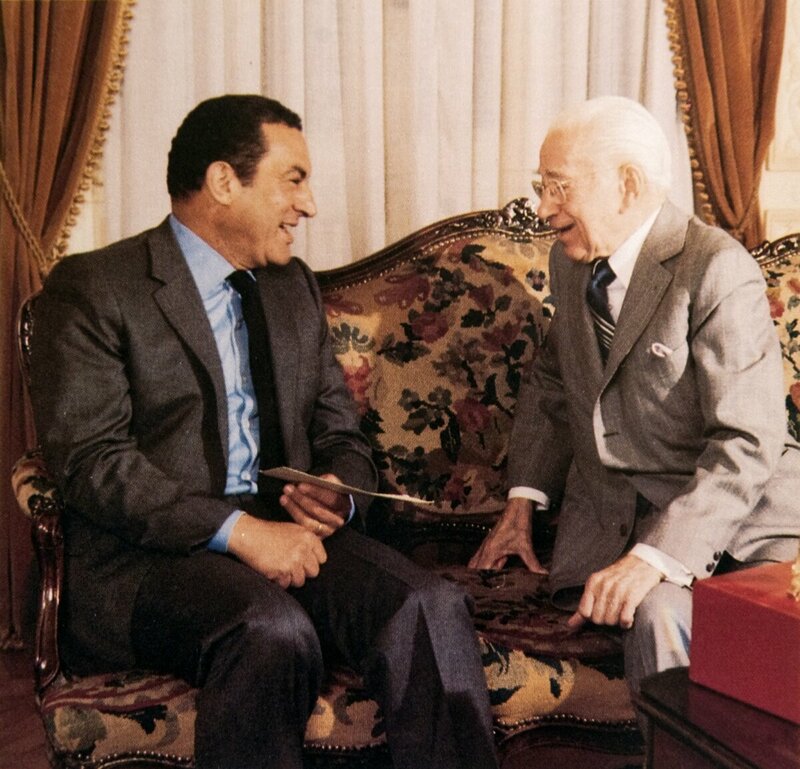 Though he met with the greats of the world from Asia to Africa to Europe and beyond, Herbert W. Armstrong’s greatest affection was for one tiny, new country at the heart of the world. He loved Israel, and Israel loved him back. 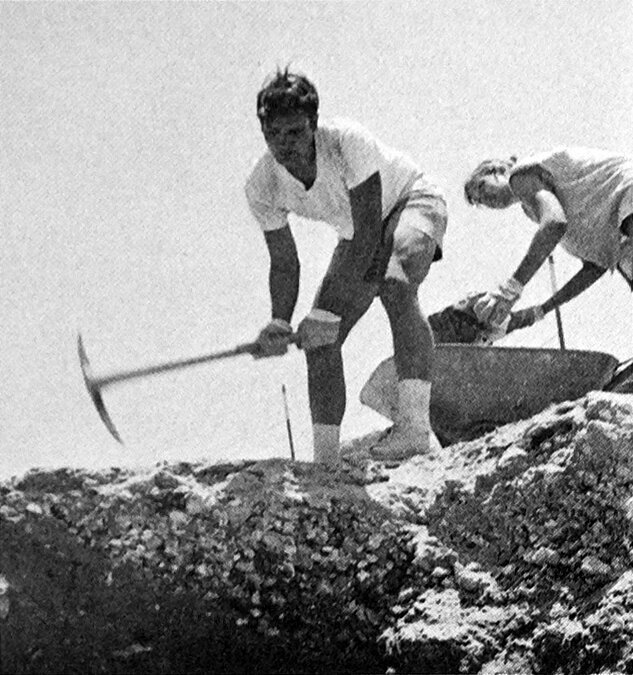 In the autumn of 1968, the deans of faculty at Ambassador’s England and California campuses took interest in an archaeological project in Israel. It was one of the most significant digs ever undertaken in Jerusalem: an excavation near the Western Wall in the Old City, recently won in the 1967 Arab- Israeli War. It was being conducted by Prof. Benjamin Mazar, director of the Israel Exploration Society, former president of Hebrew University, and recent recipient of the Israel Prize. Mr. Armstrong visited Professor Mazar’s excavation, and found that its scope was even greater than he or his staff had envisioned. He decided to look into supporting the work. Mr. Armstrong was invited to meet with Professor Mazar and Israeli leaders in a private room of the Knesset. There, Tourism Minister Moshe Kol proposed a “partnership with Israel,” which he called “an iron bridge that can never be broken” between Ambassador College and Hebrew University. Dr. Josef Aviram, dean of the College of Humanities at Hebrew University, also attended the meeting, along with other leaders, offering Mr. Armstrong and the Ambassador men such a warm welcome that Mr. Armstrong said he found it “inspiring, astonishing and most unusual.” Realizing the incredible scientific and educational value of the work, Mr. Armstrong committed to supporting it. Mr. Armstrong was invited to meet with Professor Mazar and Israeli leaders in a private room of the Knesset. There, Tourism Minister Moshe Kol proposed a “partnership with Israel,” which he called “an iron bridge that can never be broken” between Ambassador College and Hebrew University. Soon afterward, Professor Mazar and Professor Aviram accepted Mr. Armstrong’s invitation to visit the Ambassador College students in California and Texas. By now, the leaders of the excavation and Ambassador had developed mutual trust. Though the archaeologists had turned down three other major American universities seeking involvement in their project, they now offered Ambassador College a 50/50 joint participation. On December 1, 1968, several executive cars rolled up to the presidential palace in Jerusalem. 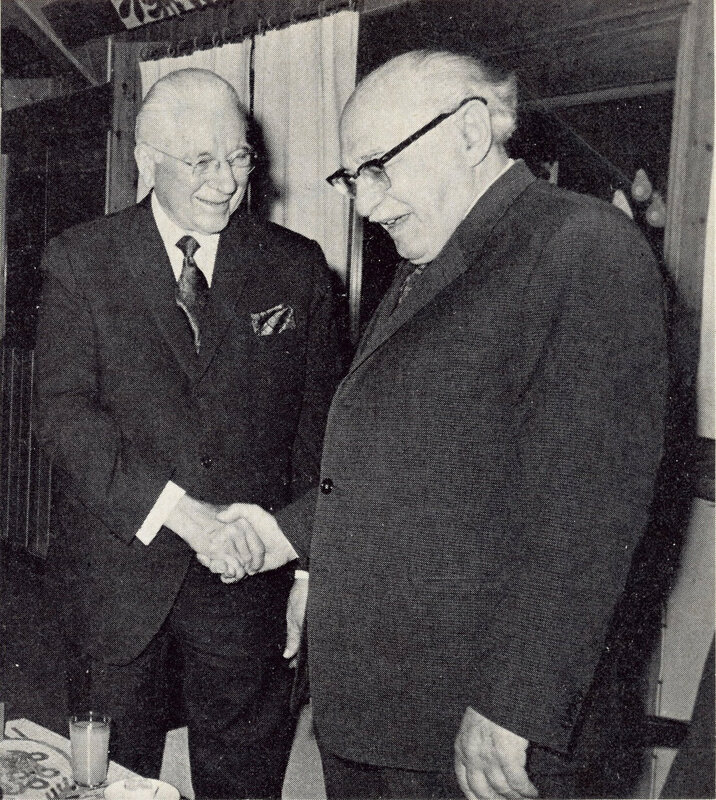 The president of Israel, Zalman Shazar, became the first head of state to meet with Mr. Armstrong. When asked if he wanted to put the relationship in a formal legal contract, Mr. Armstrong responded, “My word is good, and I believe yours is too, without any legal entanglements.” It was the beginning of a beautiful relationship that would last the rest of Mr. Armstrong’s life. 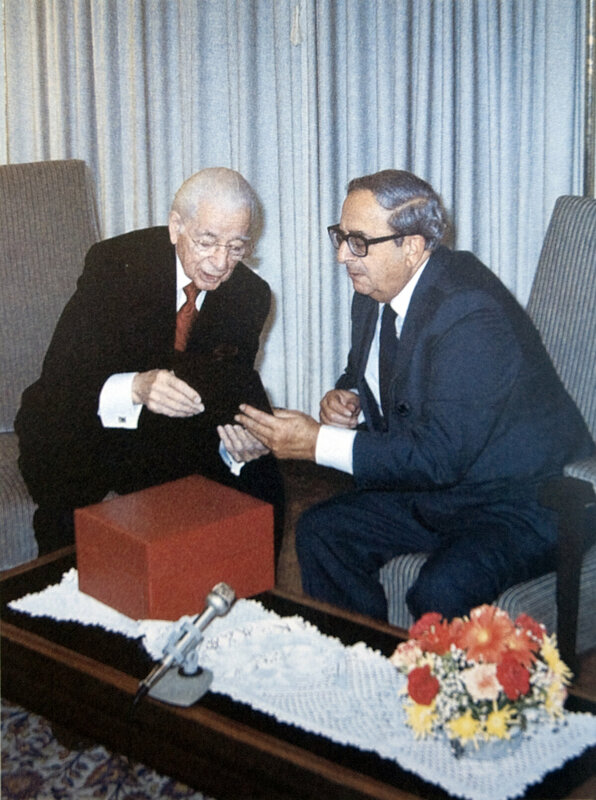 President Zalman Shazar was the first head of state to receive Mr. Armstrong. They met at Shazar’s Jerusalem residence in 1968. But Mr. Armstrong had seen small starts blossom into amazing results before. The Plain Truth went from 250 hand- cranked mimeographed copies to a circulation greater than 8 million. The World Tomorrow began as a 15-minute program on a tiny radio station and grew to nearly 400 television stations and 36 radio outlets worldwide. Ambassador College began with four students and grew to three campuses, one of which was thrice recognized as America’s most beautiful college campus. When Herbert W. Armstrong and the Ambassador students committed to their first archaeological dig in Jerusalem, they committed wholeheartedly. Around the campuses, the buzz among students was about who would travel to Israel to serve on the excavation. Each summer, scores of students excitedly packed up and flew to Israel to volunteer on the excavation, a massive site on the southern wall of the Temple Mount. The “big dig,” as it became known, would continue for a decade, and hundreds of Ambassador students would have the opportunity to touch those ancient stones. In addition to sending over what were praised as the excavation’s most enthusiastic laborers, Ambassador College shouldered half of the cost of excavations alongside Hebrew University from 1968 until the conclusion of the dig in 1976. The mutual respect between Mr. Armstrong and Professor Mazar grew. The two friends could often be seen walking arm-in-arm visiting the site, or relaxing at Dr. Mazar’s home in Jerusalem, and the professor visited Ambassador College on a number of occasions. In connection with the dig, the two men also delivered a joint lecture in Japan to Tokyo’s leading educators and scientists. The bond was natural in a number of ways. The two men shared similar traits. Both were straight-talking and uncompromising. Both were interested in taking the Bible and objectively proving the truth, whatever it might be, rather than fitting it in with preconceived beliefs. In fact, Professor Mazar was praised as a pioneer of a research discipline that fused archaeology, geography, and the histories as described in Jewish Scripture and other ancient Near Eastern sources. He was also noted for accurately reporting details about Jerusalem’s impressive Umayyad period under Muslim rule, impressing visiting Arab leaders with his candor. After years of research and labor, the big dig yielded artifacts dating back to the First Temple period in the seventh and eighth centuries B.C.—during the time of the temple originally built by Israel’s King Solomon. 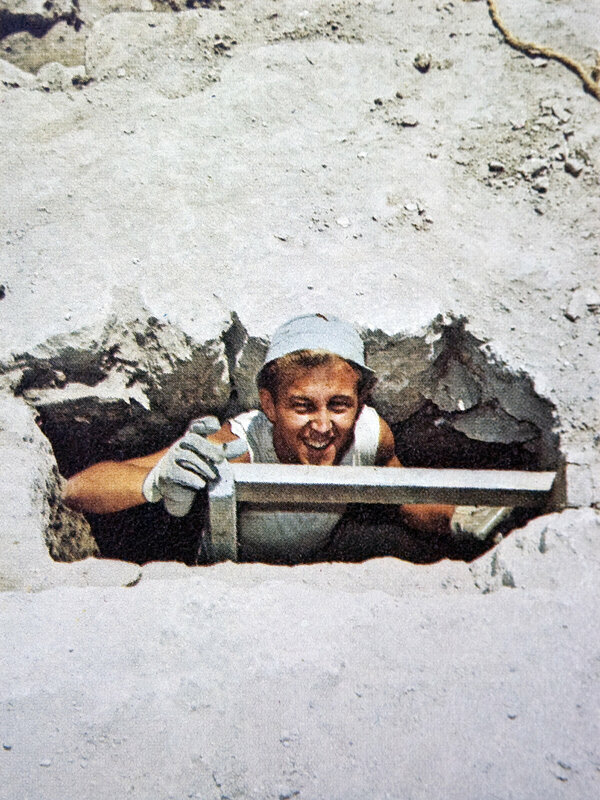 Ambassador College students participate in the “big dig” south of the Temple Mount in the 1970s. Following the conclusion of Dr. Mazar’s excavation, Mr. Armstrong continued to support archaeology in the City of David. 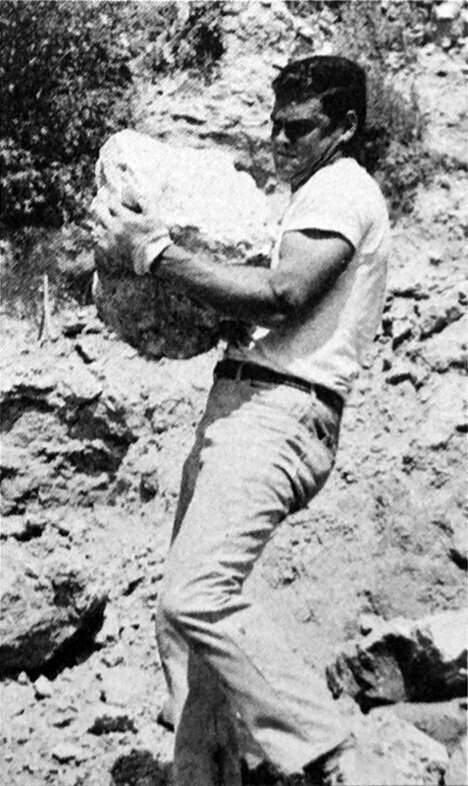 From 1980 through the summer of 1985, he sent students and donations to support excavations there led by Dr. Yigal Shiloh. Dr. Shiloh graciously accepted the volunteer help, saying that he would use Ambassador students exclusively on his archaeological projects if he could. He also visited Ambassador College to speak to the student body about the excavations. In addition to the three multi-season excavations in Jerusalem, Mr. Armstrong’s Ambassador International Cultural Foundation also supported an excavation at Tel Zeror in northern Israel. His support for archaeology spanned three full decades. Children cluster around Mr. Armstrong at Liberty Bell Park in Jerusalem, which the Ambassador Foundation helped build. In addition to support of archaeology, the “iron bridge” partnership had a second goal. That goal was to bring the children of Jerusalem—Jew, Muslim and others—together to learn the way of peace. To further that goal, Mr. Armstrong’s Ambassador International Cultural Foundation supported Jerusalem’s International Cultural Center for Youth. Mr. Kol’s dream was realized in the spring of 1960 when he founded the iccy along with U.S. First Lady Eleanor Roosevelt. Needing more funding, Mr. Kol approached Mr. Armstrong in 1968. Mr. Armstrong obliged and supported the work of the iccy and the dream of seeing children of all nations and ethnicities living and playing and growing together in the way of peace. The namesake plaque of the square in front of the ICCY. Mr. Kol saw the connection between Mr. Armstrong’s life’s work and the youth center. 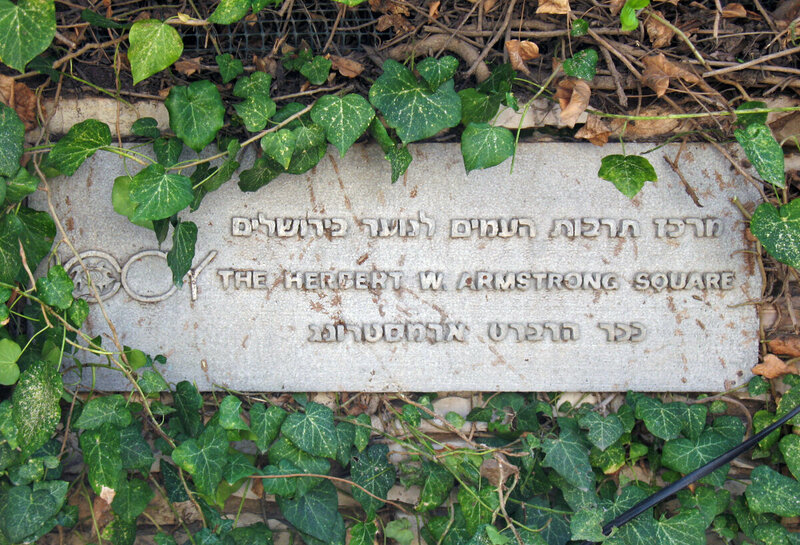 “In honor of his continued dedication to the programs and the goals of the iccy,” he wrote, “and for his success in building bridges between leaders of nations to promote peace in the world, the Board of Directors of the iccy has named the square at the entrance of the iccy building in Jerusalem the Herbert W. Armstrong Square.” Visitors to the upscale German Colony today can still see the stone plaque at the edge of the square. 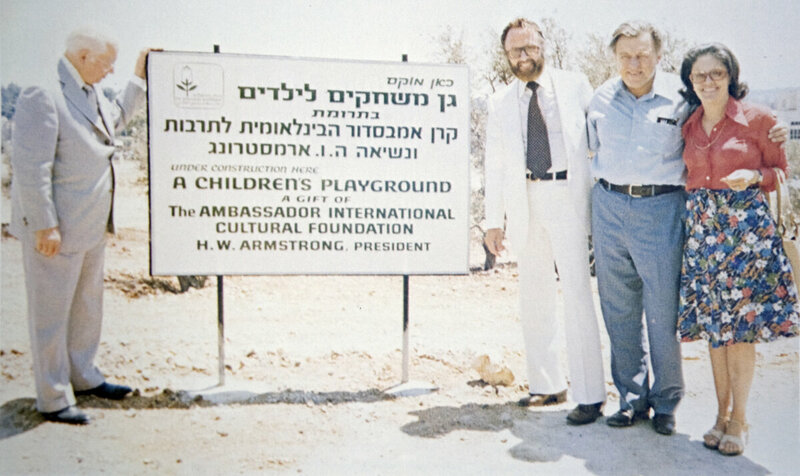 Later, in connection with the same dream of peace for the children of Jerusalem and the world, Mr. Armstrong responded to a request from Jerusalem Mayor Teddy Kollek, who hoped to develop a beautiful park in downtown Jerusalem. The Ambassador Foundation helped fund the construction of Liberty Bell Park, specifically the children’s playground at its northern entrance. Thus, Mr. Armstrong’s name was stamped on two great symbols of hope for the future of the children of Jerusalem. Mr. Armstrong (left) and Mayor Kollek (second from right), along with one of Mr. Armstrong’s assistants and his wife, inspect the site in Liberty Bell Park for a children’s playground, made possible by the Ambassador Foundation. Mr. Armstrong also supported the ICCY from Pasadena. In January 1975, the Ambassador Foundation held a benefit concert featuring Arthur Rubenstein, arguably the world’s greatest pianist and a friend of Mr. Armstrong’s, who donated his services for the event. 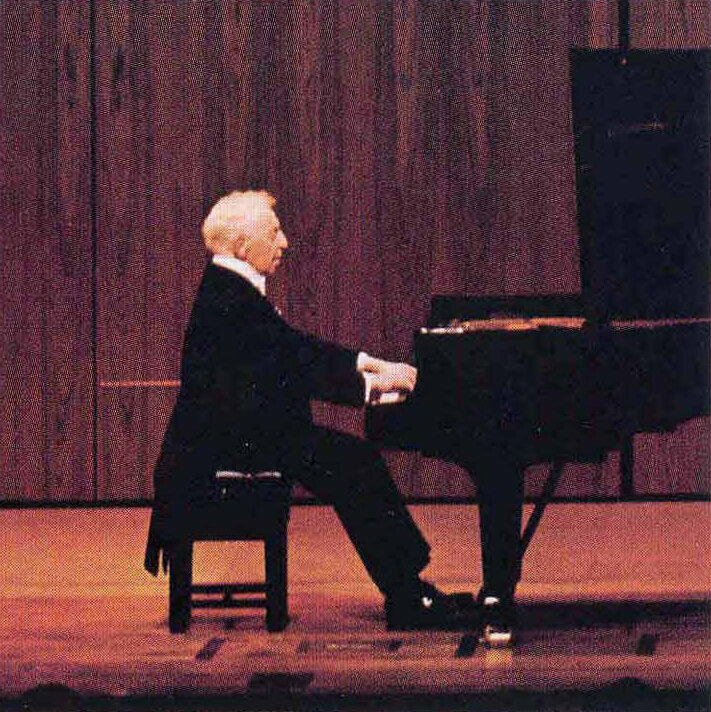 Rubenstein loved the Ambassador Auditorium Steinway piano so much that he sometimes had Mr. Armstrong ship it to him for his other concerts. Mr. Armstrong was welcomed by every prime minister and president of Israel for the rest of his life. These meetings and relationships went deeper than a simple handshake and photo opportunity. 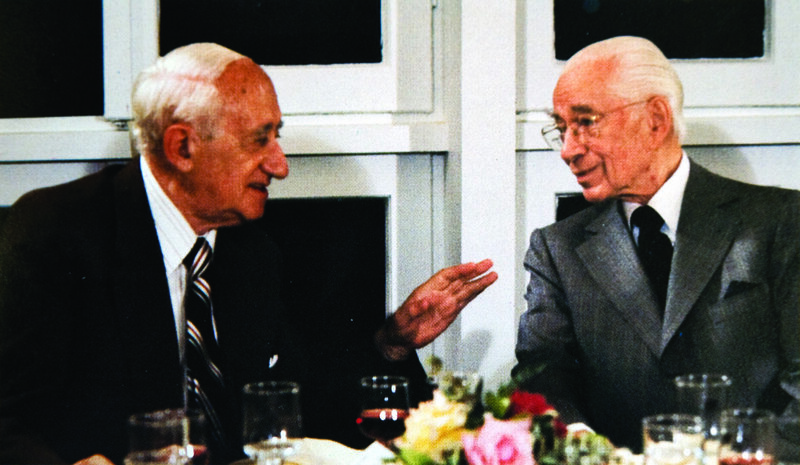 Israeli leaders valued the work, the counsel and the friendship of Herbert Armstrong. 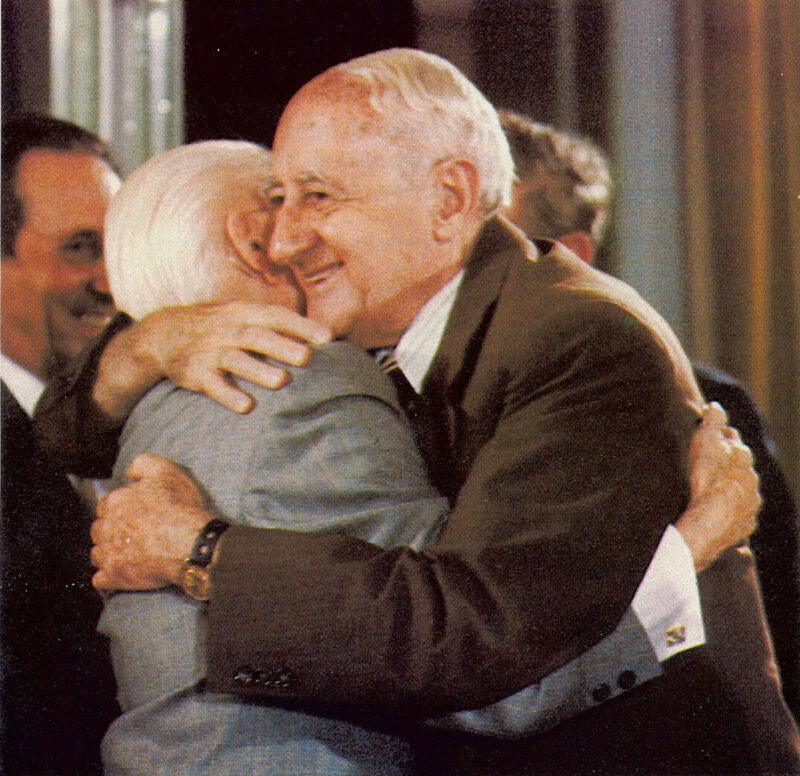 Longtime Israeli Minister of Tourism Moshe Kol and Herbert Armstrong share a warm embrace. 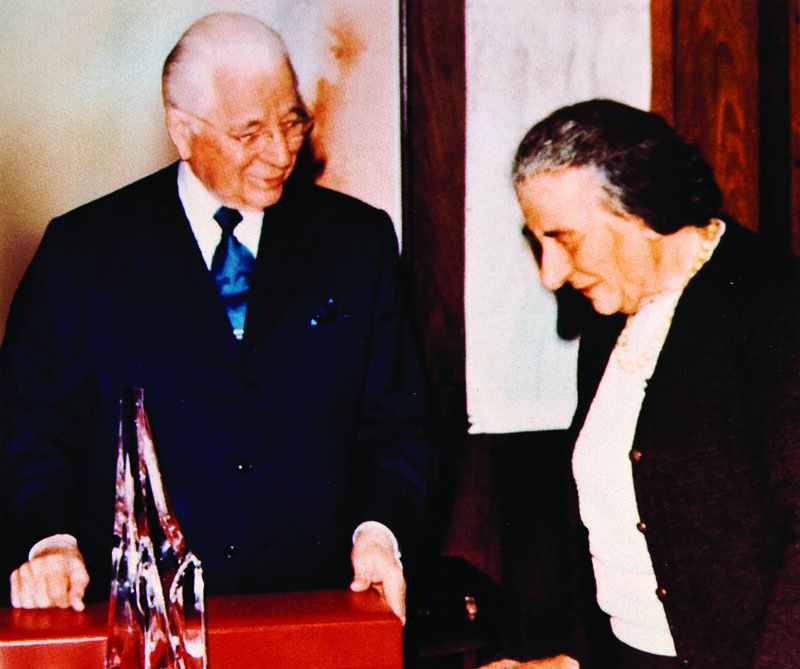 The first prime minister to open her door to Mr. Armstrong was Golda Meir, who invited Mr. Armstrong to a 45-minute meeting with her in her executive office in 1971. Mrs. Meir told him that she was well aware of the contribution Ambassador College was making toward beautifying Jerusalem and the pursuit of peace between Arabs and Jews. Mr. Armstrong meets with Prime Minister Yitzhak Rabin in his office in Jerusalem. During the 45-minute meeting, the two leaders discussed Mr. Armstrong’s friendships with Arab chiefs of state and peace among nations. Prime Minister Rabin thanked Mr. Armstrong for bringing other nations closer to Israel, especially the Arab nations. After Mr. Rabin’s first term in office, Mr. Armstrong invited him to speak to the student body at Ambassador College in Pasadena. Mr. Rabin, who would go on to serve a second term as prime minister, accepted the offer and gave a 55-minute lecture to an audience of 900 people about Israel’s right to exist being the essence of peace and reconciliation. 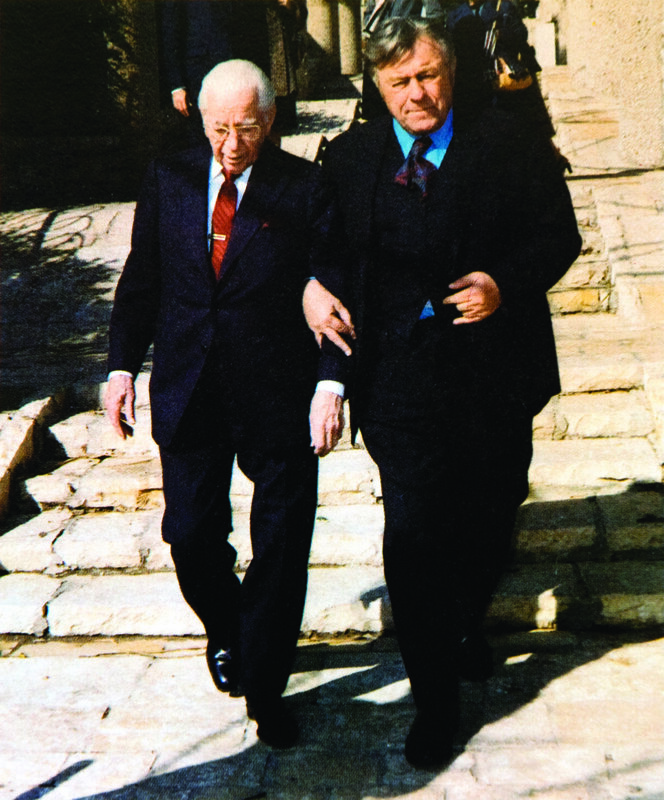 During Mr. Rabin’s term in office, Mr. Armstrong also met with President Ephraim Katzir several times. On November 3, 1980, Prime Minister Menachem Begin was in a meeting with a group of officials in Tel Aviv. An aide passed him a message, and he arose from his chair and recessed the meeting. He walked out and got in his car, and his motorcade drove the hour-long route to Jerusalem. He had learned that Mr. Armstrong was visiting Jerusalem. Menachem Begin, prime minister of Israel, welcomes Mr. Armstrong during one of his many trips to Israel in 1978. Begin was pleased to learn that Mr. Armstrong planned to feature him on the cover of the Plain Truth with Egyptian President Sadat and to honor their efforts toward peace with a lead story. The meeting ended in an affectionate bear hug. After a 21⁄2-hour recess, Begin arrived back to Tel Aviv and resumed his meeting. It was not their first visit. Before and during Mr. Begin’s tenure as prime minister from 1977 to 1983, Mr. Armstrong’s travel to the Middle East greatly increased. Mr. Begin opened his door to Mr. Armstrong on several occasions during this time. Mr. Armstrong meets with Anwar Sadat, whom he regarded as a great leader who knew the importance of peace among nations. During this crucial period in Israeli history, Mr. Armstrong developed strong ties to both Prime Minister Begin and Egyptian President Anwar Sadat. He was enamored by the sincere overtures toward peace of these two great men, and he constantly encouraged reconciliation and friendship between Israel and Egypt. 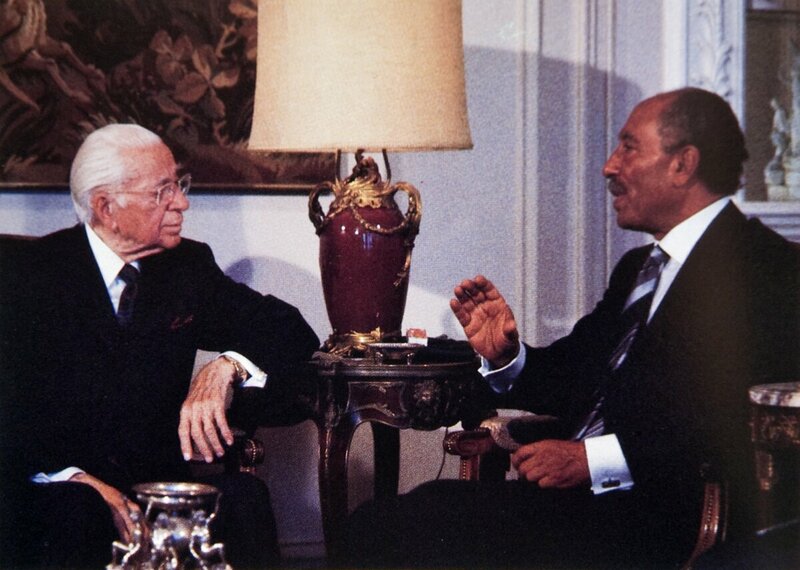 Mr. Armstrong met the Egyptian president in Alexandria in 1974, years before the Camp David Accords. Though President Sadat knew of Mr. Armstrong’s strong connections with Israeli leaders, he hosted him anyway and even lavished him with special honor and friendship. 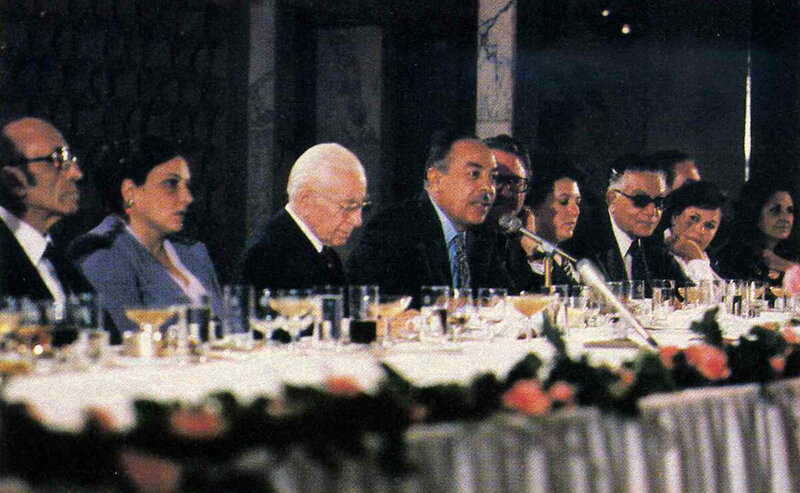 While the president spoke at an event attended by his cabinet members and other distinguished members of Egyptian government and society, Mr. Armstrong and his staff were the only non-Arabs present—President Sadat’s special guests. Israeli Prime Minister Yitzhak Rabin would later tell Mr. Armstrong emphatically that President Sadat was ready to talk to Israel long before the much-publicized intervention and shuttle diplomacy of the U.S. In fact, Rabin said that Begin and Sadat’s peace accord would have come much sooner had it been left up to only the two leaders. It was true: Sadat had confided to Mr. Armstrong early on that he was a man of peace and indicated readiness for a direct meeting. Dr. Abdul Kader Hatem, Sadat’s close adviser, introduces Mr. Armstrong to over 300 leading Egyptians for an address in Cairo. In the interim, however, memories of 1967 Egyptian-Israeli hostilities were still fresh, and tensions remained high. Flights between Israel and Egypt were restricted. After the Camp David peace talks, flights were finally permitted only between Cairo and Tel Aviv. There was, however, one notable exception. In late 1980, Mr. Armstrong spoke before a large banquet of the Egyptian-American League, including Egyptian officials and top educators. The event was hosted by Dr. Mohammed Abdel Kader Hatem, chief personal adviser to the president and himself a former prime minister. Following the dinner, Mr. Armstrong drove to the airport, boarded his plane, and was allowed to make the first flight directly from Cairo to Jerusalem. Mr. Armstrong deeply respected President Sadat’s courage, particularly after Sadat risked his life by reaching out to Israel and becoming the first Arab leader to visit Israel officially, meeting Prime Minister Begin and speaking before the Knesset in Jerusalem. The two leaders eventually concluded the Camp David Accords and signed a peace treaty in Washington, D.C., in 1979. The move was a bold step toward peace—at great risk. Mr. Armstrong was also impressed by President Sadat’s plan to build an international peace center at the base of Mt. Sinai with a mosque, synagogue and church standing alongside one another in the shadow of where God had given mankind His law—which is, in truth, the way to peace. The location of Sadat’s planned peace center symbolized the need to look to and obey God; the presence of the three places of worship symbolized the hope for cooperation and peace among the religions. Mr. Armstrong knew Sadat’s dreams of peace were far advanced of, and deeply at odds with, the violent times in which he lived. Less than a year later, Anwar Sadat was murdered for pursuing peace. Unrest increased, and the planned peace center never materialized. Mr. Armstrong meets with Egyptian President Hosni Mubarak not long after Anwar Sadat gave the ultimate sacrifice for peace. Mr. Armstrong went on to keep his next appointment with the president of Egypt, but it was with Hosni Mubarak, not Anwar Sadat. The tragedy fresh on their minds, Mr. Armstrong and President Mubarak agreed that men should do what they can, but that a higher power was needed to bring real peace. During this tumultuous period, Mr. Armstrong also maintained a close friendship with King Hussein of the Hashemite Kingdom of Jordan. Indirect dealings with the king dated back to 1966, when Mr. Armstrong was interested in enhancing Radio Jerusalem. Although the Six Day War completely changed the situation, Mr. Armstrong continued to support Jordanian cultural activities, mostly through the university. 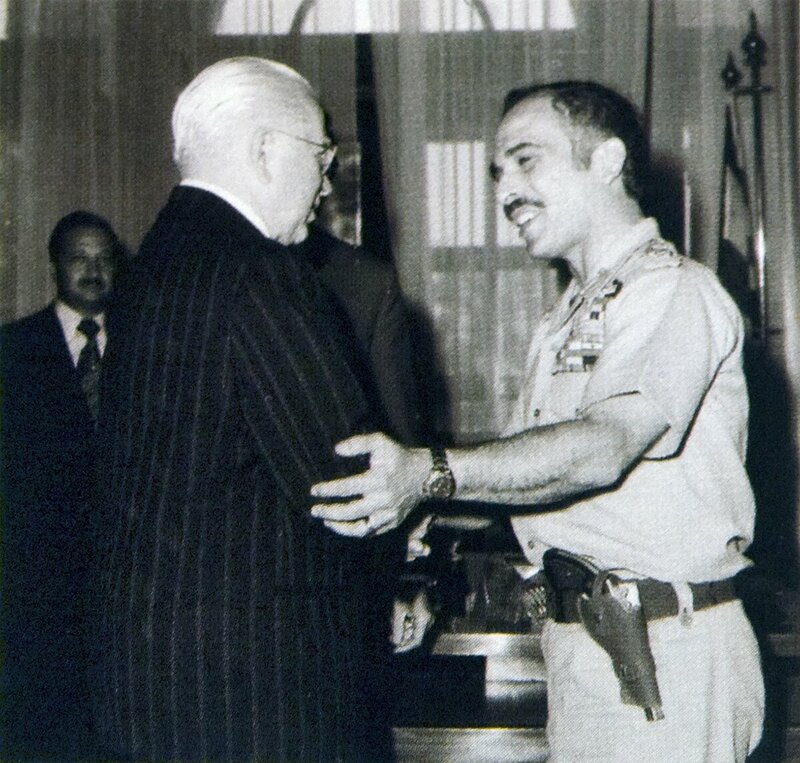 Mr. Armstrong meets with King Hussein of Jordan in 1974. King Hussein welcomed Mr. Armstrong to Jordan in 1974. Mr. Armstrong told the king that he had read his autobiography and felt as though he knew him. When Mr. Armstrong mentioned that he was finishing the second volume of his own auto- biography, the king asked that he sign the first copy off the press and send it to him. Mr. Armstrong obliged, and suggested that the king write a volume two to his own autobiography. King Hussein warmly accorded Mr. Armstrong the honors of a visiting dignitary, arranging meetings with the crown prince, prince, princess, prime minister, minister of information and president of the university. A reception and a large banquet were held in his honor, with television and radio news journalists reporting the events. 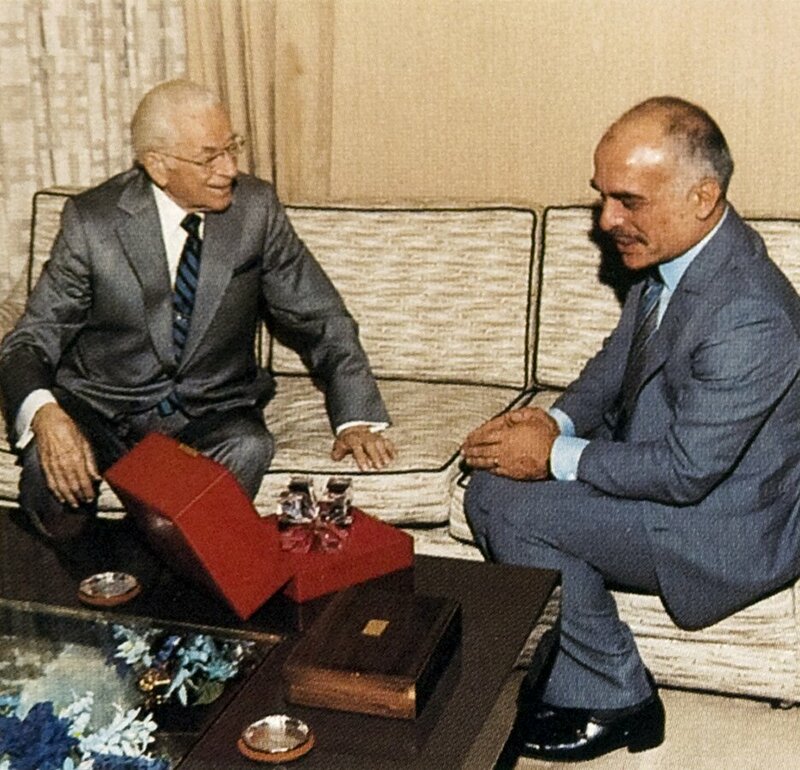 Herbert Armstrong presents a gift to King Hussein, a longtime friend. They first met in Amman in 1971. Mr. Armstrong and the king continued to develop their relationship. On another visit to Amman in March 1982, the two men planned to meet again. However, the king had to rush to the airport in the middle of the night to fly to Iraq where his army was on a major offensive against Iran. Mr. Armstrong returned in July, yet he still had to wait five days, as the king was yet in the midst of the turmoil. When the king finally cleared time to see his American friend, he had to keep the chief adviser to President Mubarak, who had flown to Jordan with a special confidential message from the president, waiting in another room. Though troubled by war, King Hussein went on to leave a legacy of honor. He was known as a force for dignity and hope, one of the last peacemakers. Mr. Armstrong presents a personal protocol gift of Steuben crystal to Israeli President Yitzhak Navon. In December 1978, Mr. Navon hosted a special tribute dinner for Mr. Armstrong at his presidential palace to celebrate Mr. Armstrong’s 10 years of partnership with Israel. During this trip to honor his involvement, Mr. Armstrong met with President Navon, Prime Minister Begin, Foreign Minister Moshe Dayan, Labor Party Chairman Shimon Peres and Knesset Speaker Yitzhak Shamir—in one day. Mr. Armstrong also celebrated the milestone with a dedication ceremony at Armstrong Playground in Liberty Bell Park and a performance by Israeli and Arab teens at the International Cultural Center for Youth. Mayor Teddy Kollek also hosted a special dinner in Mr. Armstrong’s honor with prominent guests. The spotlight also returned to the iron bridge when Mr. Armstrong reunited with Professor Mazar and Professor Aviram in the Mount Scopus campus of Hebrew University. Deputy Prime Minister Yigael Yadin and other prominent Israelis also attended the luncheon. Speaking about his experience with King Hussein, Mr. Armstrong said, “I know he would like to have peace with you,” He recounted to Prime Minister Peres how he had told the king he wanted to bring Prime Minister Begin to Jordan aboard his airplane and leave the two leaders alone, giving them the opportunity to get acquainted. Accompanying Mr. Armstrong on most of these visits with Israeli leaders was a man who sat in the gate of Jerusalem perhaps longer than anyone else: his long time friend, Teddy Kollek. When Mr. Armstrong visited Jerusalem, Mr. Kollek went far beyond his duty as mayor. He viewed Mr. Armstrong as more than just another foreign dignitary—he treated him as a valued friend and confidant. Called the greatest builder of Jerusalem since Herod the Great, Mayor Kollek strived to beautify the city for all of its inhabitants, whether Jew, Muslim or Christian, and was known for his candor and honesty. He and Mr. Armstrong developed a strong bond that sprung from their mutual love for Jerusalem, and this developed into archaeological advancement, harmony among young people at the International Cultural Center for Youth, and the children’s playground at Liberty Bell Park, among other things. 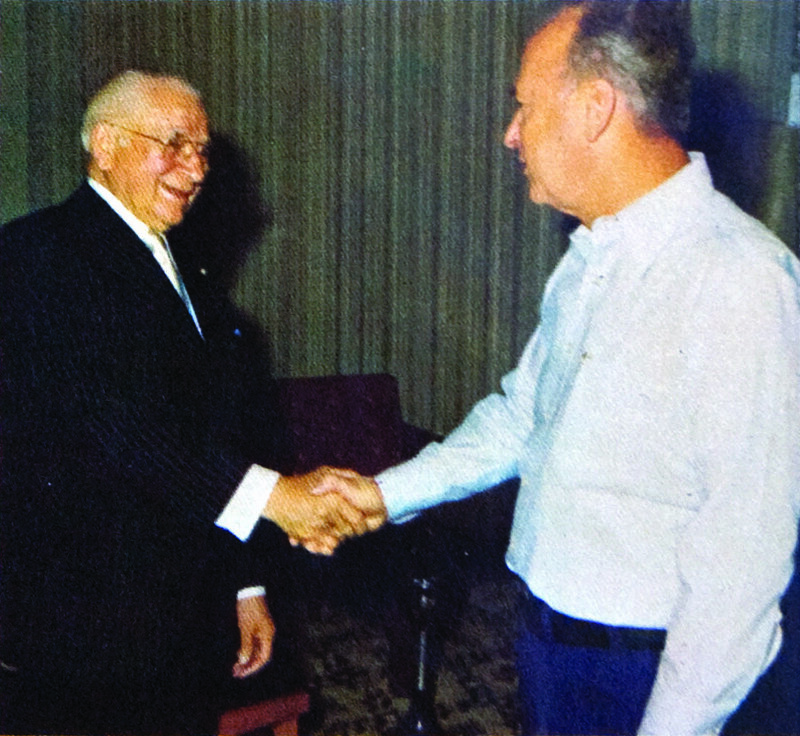 Mayor Kollek also returned the favor and visited Mr. Armstrong in California in 1971. After seeing it, the mayor said he wanted to follow the example of beauty Mr. Armstrong set at the Ambassador College campus in Pasadena. Less than two weeks after Mayor Kollek visited Pasadena, Mr. Armstrong was at Hebrew University in Jerusalem. He and other representatives of the Ambassador International Cultural Foundation were conferring with the university’s Institute of Urban and Regional Studies, with which they were in a joint participation city-planning project. The goal: to plan the Jerusalem of the future. 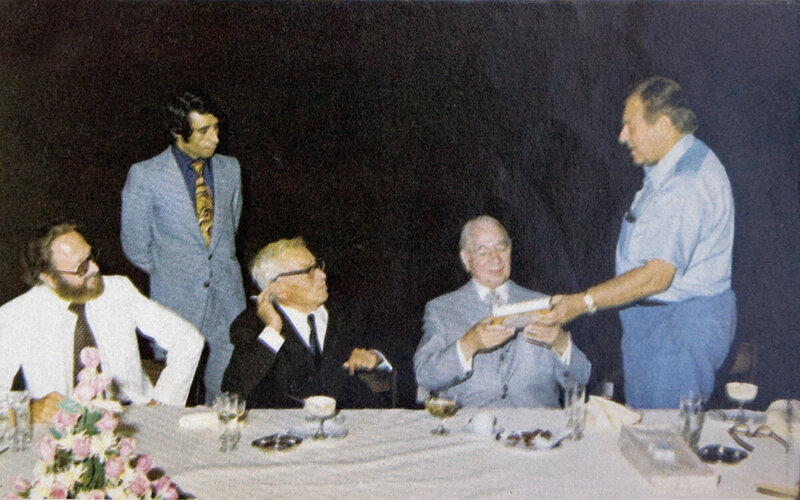 During a luncheon, Mayor Kollek hands Herbert Armstrong a gift as Professor Mazar looks on. Shortly before Mr. Kollek’s death, he wrote that he held high regard for this “special man and his mission for peace.” In 2004, he said, “There have been very few people that I have known that I so enjoyed speaking with and so greatly admired and valued their counsel.” Mr. Armstrong felt the same way about his very close friend. Over his lifetime, Mr. Armstrong also met with Vice Mayor of Tel Aviv Yitzhak Artzi, Ambassador to U.S. Meir Roseanne, Foreign ministers Moshe Dayan and Abba Eban, Mayor of Bethlehem Eliahu Freij, the Jewish representative to UN charter signing Elias Elath, Knesset member Gideon Hausner, archaeology professor Nahman Avigad and Hebrew Universtiy professor Yisrael Paldi. He also met with members of the royal families of both Jordan and Saudi Arabia, and various ambassadors from other Middle Eastern countries.